Google has agreed to a $17 million settlement with states over the circumvention of Safari privacy settings. New York Attorney General Eric T. Schneiderman announced that of the $17 million in settlement money, New York will receive $899,580. "Consumers should be able to know whether there are other eyes surfing the web with them. By tracking millions of people without their knowledge, Google violated not only their privacy, but also their trust," Attorney General Schneiderman said. "We must give consumers the reassurance that they can browse the Internet safely and securely. My office will continue to protect New Yorkers from any attempts to deliberately expose their personal data." The WSJ revealed that Google had bypassed Safari's settings in February 2012. In August 2012, Google agreed to pay a record $22.5 million civil penalty to settle Federal Trade Commission charges that it misrepresented to users of Apple Inc.'s Safari Internet browser that it would not place tracking "cookies" or serve targeted ads to those users. Last month, a federal judge in Delaware dismissed a class-action lawsuit brought against Google over its actions. Google operates the most popular search engine on the Internet. Use of the search engine is free, so Google generates revenue primarily through advertising. Through its DoubleClick advertising platform, Google sets third-party cookies — small files set in consumers’ Web browsers — that enable it to gather information about those consumers. Depending on the type of cookie, this information could include consumers' Web-surfing habits. Apple’s Safari Web browser is set by default to block third-party cookies, including cookies set by DoubleClick to track a consumer’s browsing history. 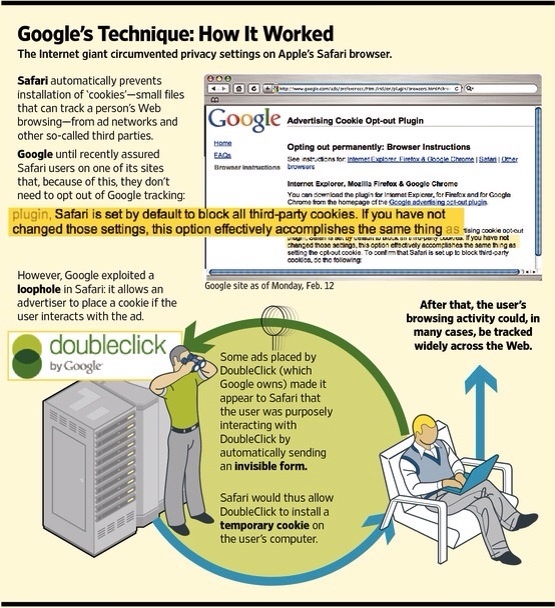 From June 1, 2011, until February 15, 2012, Google altered its DoubleClick coding to circumvent those default privacy settings on Safari, without consumers’ knowledge or consent, enabling it to put DoubleClick cookies on consumers’ Safari Web browsers. Google disabled this coding method in February 2012 after the practice was widely reported on the Internet and in the media. ● Not deploy the type of code used in this case to override a browser’s cookie blocking settings without the consumer’s consent unless it is necessary to do so in order to detect, prevent or otherwise address fraud, security or technical issues. ● Not misrepresent or omit material information to consumers about how they can use any particular Google product, service, or tool to directly manage how Google serves advertisements to their browsers. ● Improve the information it gives consumers regarding cookies, their purpose, and how the cookies are managed by consumers using Google’s products or services and tools. ● Maintain systems designed to ensure the expiration of the third-party cookies set on Safari Web browsers while their default settings had been circumvented. New York was a member of a 10-state executive committee, which also included Connecticut, Florida, Illinois, Ohio, Maryland, New Jersey, Texas, Vermont and Washington. The multistate agreement also included the Offices of the Attorney General of Alabama, Arizona, Arkansas, California, District of Columbia, Indiana, Iowa, Kansas, Kentucky, Maine, Massachusetts, Michigan, Minnesota, Mississippi, Nebraska, Nevada, New Mexico, North Carolina, North Dakota, Oklahoma, Oregon, Pennsylvania, Rhode Island, South Carolina, South Dakota, Tennessee, Virginia, and Wisconsin. Assistant Attorney General Clark Russell represented New York in the multistate investigation, under the supervision of Executive Deputy Attorney General of Economic Justice Karla G. Sanchez.